Utah’s Hole in the Rock road is sometimes referred to as “57 miles of hell” — good for trashing vehicles, less useful for accessing Grand Staircase-Escalante National Monument’s slot canyons and historic sites along the route named for the 1879-80 pioneer expedition. Yet it is the monument’s most traveled road and the busiest non-state highway in Garfield County, seeing up to 200 vehicles a day, according to county engineer Brian Bremner. And many visitors aren’t pleased with the famous road’s sorry, channel-like condition that turns the drive from Escalante to Glen Canyon into a three-hour ordeal, on a good day. Now, the county has the money to rebuild Garfield’s 16-mile stretch of the road and is seeking the Bureau of Land Management’s permission to proceed. County officials say they plan to repair past flood damage, narrow the roadway, shore up culverts and make it easier to maintain and drive on. Maintaining the road is currently a never-ending task, they say — where grading crews continually work the road bed, yet mud bogs still form, ensuring the road continues to widen as drivers go to the sides to avoid pools. Bremner figures his crews regrade the entire road up to 20 times each tourist season, from April to October, plus an additional six times a year for the Garfield County end. Garfield maintains Kane County’s 40-mile share of the road, but the proposed project covers just the 16 miles closest to Escalante. “Inadequate drainage has led to an increasingly deeper and wider travel surface resulting in repetitive road blading events that further entrench and widen the road, further complicating maintenance and the stability of the road,” the Bureau of Land Management reported in a notice announcing an environmental assessment of the $1.7 million project. The federal agency will join Garfield officials at public meetings this week in Escalante and Boulder. 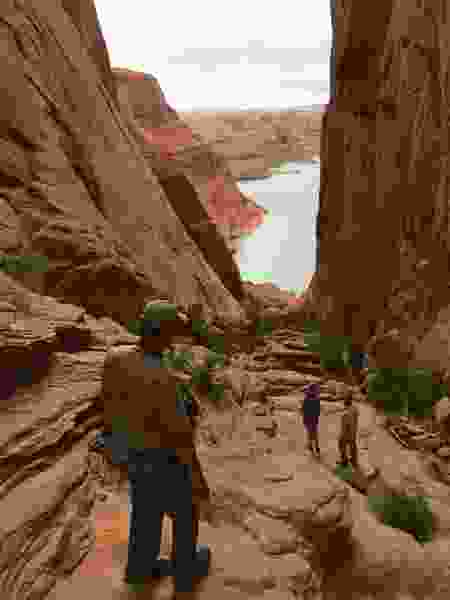 Utah and federal officials have been exploring developing a state park at the southeastern end of the road, where Mormon pioneers built a wagon road through a cleft in the rocks above Glen Canyon. Because of the historic spot’s remoteness, however, state parks officials are doubtful such a park could financially support itself, although repairing the road could make a park idea more viable. Jerry Roundy, founder of Escalante Heritage Center, which has pushed the park idea, would like to see the road surface hardened eventually. The center is interested in facilitating tours of Hole-in-the-Rock to help connect young Utahns with a heroic achievement of Western settlement, but the time and effort it takes to drive there is getting in the way. The national monument’s management plan bars pavement or significant upgrades to the road, but the fix Garfield has in mind squares with the BLM’s obligation to maintain the road’s historic character and protect monument resources, according to associate monument manager Matt Betenson. The project would rebuild the bed into a “crown-and-ditch” structure, with preliminary design envisioning 26 feet traveling lanes and shoulders, with 10-foot slopes on either side. The BLM is accepting public comments, to be used to guide the environmental review, through Nov. 9. Comments can be sent to Betenson at 669 South Highway 89A, Kanab, UT84726 or by email at blm_ut_gs_comments@blm.gov. Scoping meetings are to be held Wednesday at the Escalante Community Center (85 N. 100 West) and Thursday at the Boulder Community Center (351 N. 100 East).